Are you bored with your oatmeal? Let's give it a makeover! My husband started adding peanut butter to his oatmeal because he was always hungry before lunch after eating his oatmeal for breakfast. He adds a tablespoon of peanut butter (which will bring up the recipe below by 58 calories). I started adding an apple because I have trouble getting servings of fruits and/or vegetables in every meal. How else are you going to hit 5 per day? The nice thing about the apple is it gets really soft and adds a delicious flavor to the oatmeal. This creates a great taste combination - apples and peanut butter! And, you have whole grains, a non-meat source of protein, and a fruit to start your day. Combine water, apple juice, rolled oats, and apple in a small saucepan and turn heat to hight. When the water boils, turn the heat to low and cook, stirring, until the water is just absorbed, about 5 minutes. Cover the pan and turn off the heat. Five minutes later, spoon into a bowl and add 1 teaspoon peanut butter and more sugar (brown sugar, honey, maple syrup) if desired. What do you add to oatmeal to dress it up? I love oatmeal! I've been adding peanut butter for some time. I use the chunky kind just to give it a little interest. I sometimes add a dash of cocoa powder and cinnamon. Frozen banana slices are great, too. Just drop a few in after it's cooked. They cool the oatmeal to a quickly eatable temperature and add natural sweetness. And yes, sometimes I add all those things in the same bowl!! Also you can add some dried cranberries while you're cooking the oatmeal for a nice zingy taste. I'm going to try this! For our oatmeal I add wheat germ, brown sugar, ground flax seed, sunflower seeds and a little milk. Love this idea! I always cook my oatmeal in skim milk instead of water. After it is cooked I add raisins and walnuts. Yummmy! I add pnut butter, and also dried cherries, a few raw almonds and a dollop of fat free Greek style yogurt such as Fage or Chobani or Trader Joes. Yuuuuuum! i have to add that i got a beautiful japanese rice cooker for christmas, and last night i set it up with steel cut oats, timed to be ready at 6:30 am. omigod! the most beautiful hot oatmeal was waiting for me. now i'll start putting on some of the wonderful toppings described here. i've long cooked apples, raisins, and cranberries in with my oatmeal (and always lot of cinnamon). My oatmeal is usually topped with a drizzle of sugar free caramel and pear or peach with maple syrup. @Judy: Yes! The Dark Chocolate Peanut Butter is great in oatmeal. Also Nutella! I just noticed that January is National Oatmeal Month! I love to add up to a whole banana, depending on it's size, to one serving of oats. It breaks down during the cooking process, especially if you stir it up well as you go, and your oats become super creamy and smooth. Very delicious, not a strong banana flavor, and you get a little extra oomph from your oats as well. I just recently started eating oatmeal every morning adding peanut butter & banana. This combination has inspired me to actually eat breakfast (a habit that I have not had in the past) and it keeps me full to lunch. I love topping my oatmeal with RediWhip whip cream with a dash of cinnamon on top! I eat oatmeal almost every day and I like to switch up the toppings so I don't get bored. Peanut butter and apple is a great standby; I also like using unsweetened applesauce, frozen berries, almost any fruit and cinnamon - not all together. I top mine with flaxseed, which you can't taste at all. I just made this recipe, but at night (I never have time in the morning!) and just decided to put it in a microwave safe cup and microwave in the morning. I halved the recipe, and if filled more than my cup can hold so I ate the rest with some peanut butter at night. Let me tell you, this recipe is DIVINE. I love to add chopped nuts to my oatmeal. I'll buy a bag of chopped walnuts or almonds or pecans or sunflower seeds and add a Tbsp. to my hot oatmeal. That, with some fruit on top, is really good. I really enjoy reading all the good ideas each of you have offered. Ilike to sweeten my oats with honey. I love oatmeal! I always put water and milk into a pan. It makes it really creamy, but the peanut butter would be so yummy. I sometimes add ground flax, craisins, walnuts, bananas to my oatmeal. Yummy! Is it weird that I think of squid girl every time I see the words snack girl? Thanks for the peanut butter info. I have been meaning to do this for... a long time now!Question: In trying to prioritize budget-wise, I was wondering if you know about the relative importance of choosing organic peanuts? I seem to remember hearing that peanuts are often crop-rotated with cotton, one of the most sprayed crops- do you know anything more about that? I need to stretch my food dollars, and I live in a state that produces lots of peanuts, so would like to know what to consider to make an informed decision. I add bacon bits or crumbled bacon to mine when I am cooking it, WHO DOESN'T LIKE BACON???????? 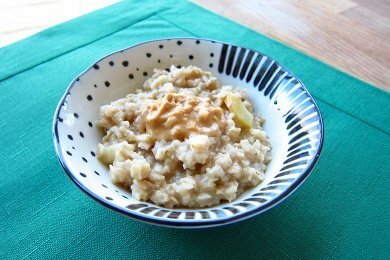 re: top 10 apple snacks, the oatmeal lists hubbies oatmeal as 1Tsp however at the intro to this recipe you mention 1Tbsp which I would most likely do but, could you please clarify this for us. Thank you so much and keep up the great snacks. I have been putting peanut butter and a cut up apple in my oatmeal for years. This is my favorite breakfast. I cook 1/2 cup oatmeal and 1 cup water in microwave. Add 1/3 cup nonfat powdered milk, 1 cup water, 1 sliced banana, cinnamon, vanilla, and 1 tablespoon chia seeds. I'm satisfied until lunch. But peanut butter would be a good addition to this! Oatmeal - soaked over night then cooked on the stove with some coconut milk (organic canned style), sweet potato mash, cinnamon, nutmeg, five spice, dry ginger and vanilla. IT IS SOOO GOOD! I am so going to make this tomorrow!! my kids need an oatmeal makeover!!! Does the nutritional info provided include the peanut butter? I add powdered protein powder (vanilla flavored) and chia seeds to my oatmeal. I find if I get an extra serving of protein with breakfast, I stay satiated through lunch. I also change it up daily with different fruits and nuts combinations (apple & cinnamon, bananas and chopped hazlenuts, blueberries & strawberries, etc. ).